Bump and Go Rescue Fire Engine w/ Lights and Realistic Sounds. 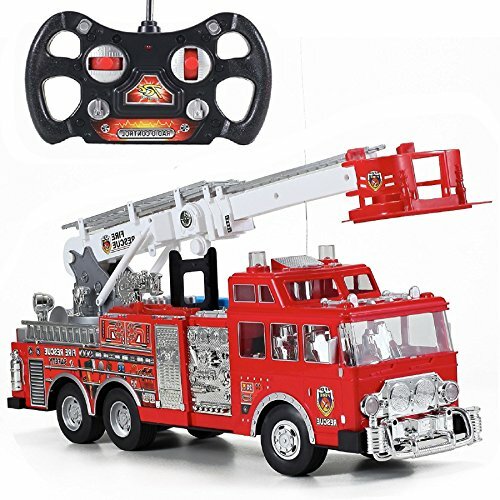 This battery operated Fire Truck is 12" long with retractable & 360 degree turn-able ladder. Requires 3 "AA" batteries (not included). Box size: 13.75"L x 3.25"W x 4.5"H. Ages 3 and Up. 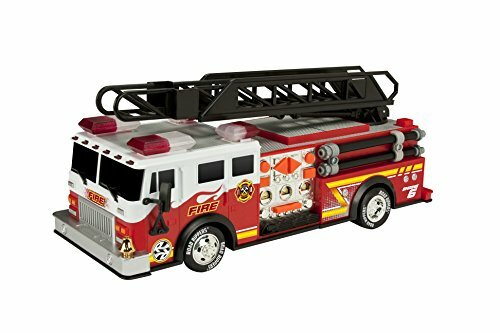 The WolVol Electric Fire Engine Emergency Vehicle Rescue Truck Toy for kids, is built with high speed wheels and beautiful flashing 3D lights. The 3D light effects is very attractive and colorful. The WolVol Electric Fire Truck has a mind of its own; it will drive as if a human is driving it. When it bumps into anything, it will automatically turn away and drive to the other direction. It is installed with high functional sounds and makes the noise of a firetruck. It is the perfect idea for Gifts, Birthday Presents, Christmas Gifts, etc. This R/C Rescue Fire Engine w/ Lights and Siren will be your sons dream become true . 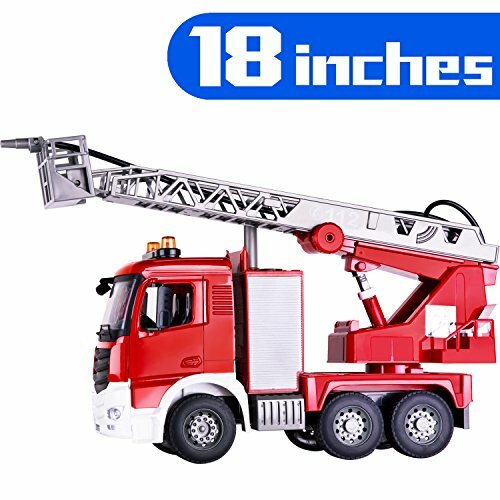 This remote controlled Fire Truck is 15'' long with full function, extendable ladder. Includes transmitter. Requires 5 "AA" for fire truck and and 2 "AA" batteries for remote (not included). Frequency is 27 mHz. Ages 3 and Up. 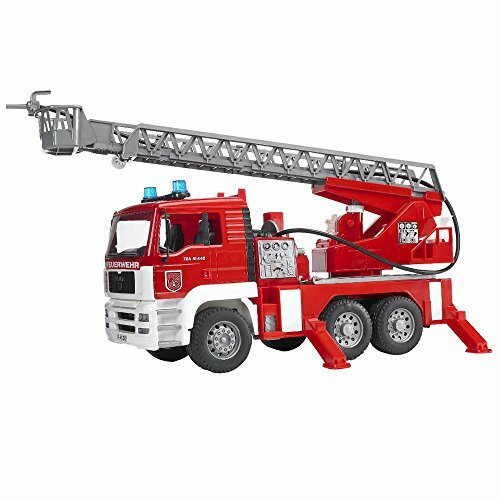 Improve the imaginative skills of your child with Green Toys Fire Truck. This toy truck is made with plastic milk jugs containing no BPA, phthalates, or PVC — this toy is safe for environment as well as your child. Molded detailing on the body of the truck including hatchets compartments, dials along with GTFD shield ensures safety of your child against injuries while playing. This toy truck is also useful for improving the gross motor and motor skills along with the development of pincers grip. 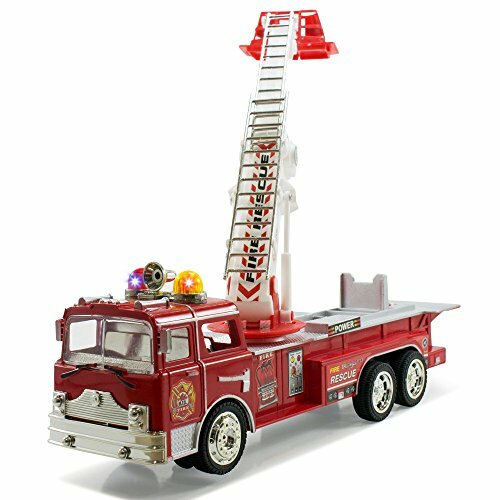 Keep your toddlers entertained while playing with our 6 pieces fire engine truck toys. As we all known, the little boys are very obsessed with the toy car. They want to own all especially toy cars with various themes. 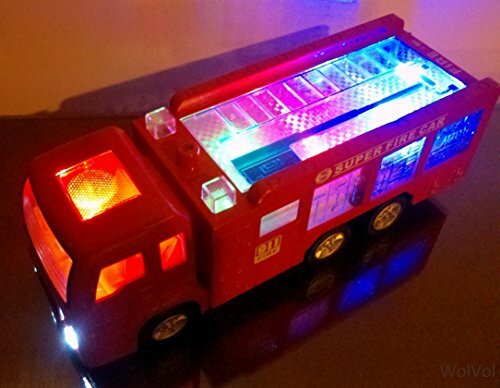 This bright color fire vehicle toy set can attract children's attention at once and let most of the kids imagine being a firemen when they grow up. Mini Fire Engine. - Each toy car is about 1 x 3 x 1.5 inches, 1:87 scale mini size is perfect for baby boys. - The weight of each model car is about 0.59 lb, children can put it into pocket and carry it outside easily. 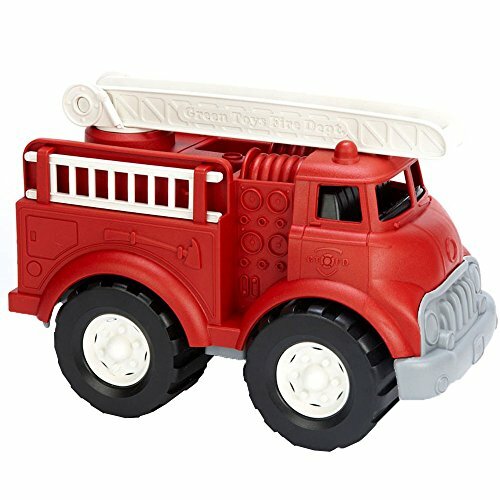 - Alloy play firetrucks toy, not a pull back vehicle, but with working wheels and some parts can move. Stimulate Learning Desire. 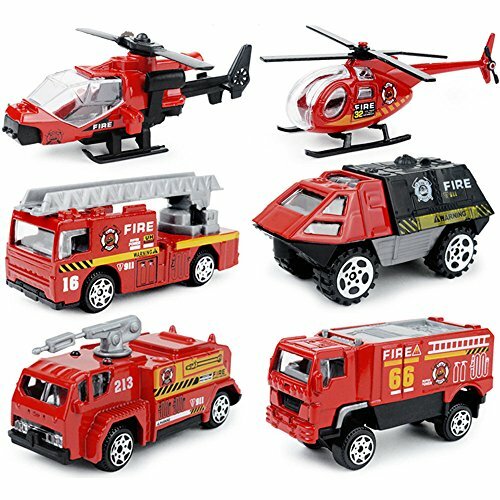 - Five different kinds of mini fire engines, some little kids may not be able to distinguish and even can't tell the name of these cars. They will chase you to ask and learn about knowledge of different types of vehicles. - You can also tell children more about fire knowledge with this toy car. Let them have a sense of safety precaution awareness. 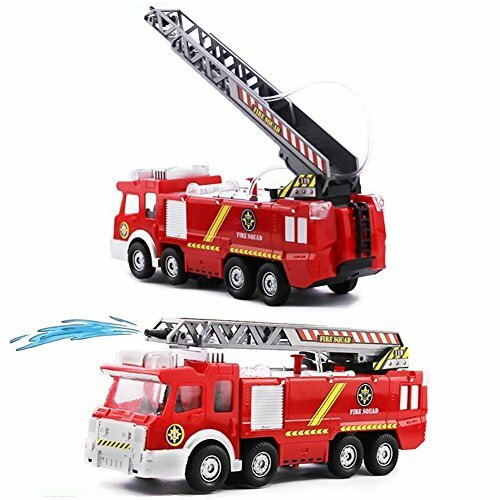 Specification: - Material: Alloy + plastic - Each fire engine: about 1 x 3 x 1.5 inches - Weight: 0.59 lb - Package size: 13.7 x 3.9 x 1.3 inches Notice: - Not suitable for children under 3 year old. - No batteries required. 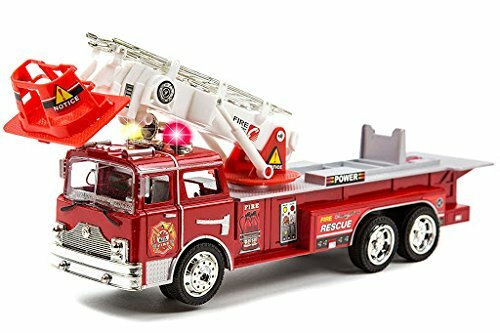 Compare prices on Fire Engine Truck at ShopPlanetUp.com – use promo codes and coupons for best offers and deals. We work hard to get you amazing deals and collect all available offers online and represent it in one place for the customers. Now our visitors can leverage benefits of big brands and heavy discounts available for that day and for famous brands.